Is your Japanese scrawls as bad as ours? 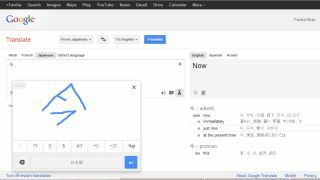 Google has added a new tool to its Google Translate extension that lets you translate handwriting from 45 different languages. It added this feature for Android last year, but now any Chrome user will be able to scrawl their best Japanese using their mouse. It's a simple tool where you select the handwriting input for available languages, then draw the characters in the box providing using your cursor. It's a handy little addition that could come to use when trying to learn a new language – or when you can't quite copy+paste something. Don't worry, these blips don't need translating.